The design for the backs of the Deckahedron cards is done, and I just wanted to share it. look at those little dots! 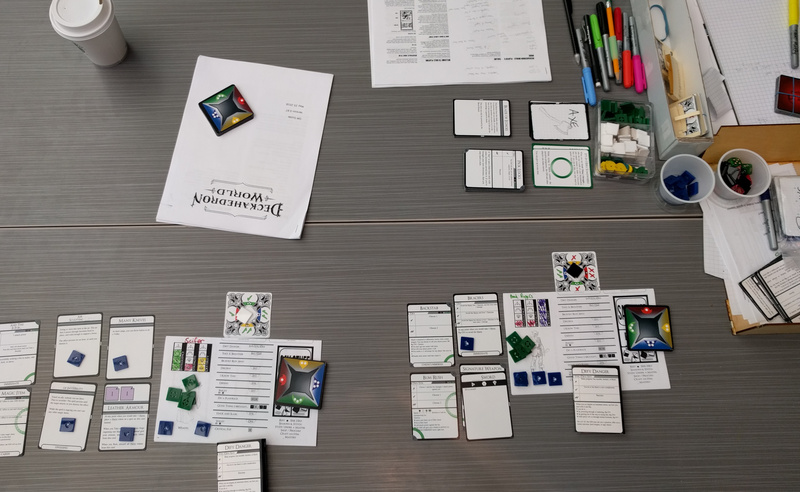 After analyzing Genesys and FATE, I’m now ready to tease apart all the different steps in the core resolution mechanism of A Thousand Faces of Adventure. And here it is. I think I’ve done a good job keeping it tight, and bottlenecking in the lines rather than having an exploding spiderweb. But I’m biased of course. More exercise! I’ve been drawing up some flowcharts for the “core resolution mechanism” of a few different RPGs. Here’s the flowchart for Genesys. And here’s the source svg. The most important feedback I got at KublaCon this year was that my title needs to be better. “Deckahedron World” appealed to me because I like puns, and I felt it was a nice nod to it’s parent, Dungeon World. But the title of the game isn’t for me, it’s for the audience, and “Deckahedron World” doesn’t serve the audience. It doesn’t help the audience know what the game is about. If someone walked into a game shop and saw a box on the shelf saying “Deckahedron World”, would they have any impression about whether this was something they would enjoy? Would they want to pick up the box and have a look? Thanks to James Ernest for helping me see this. Which of these names do you think would give you a good impression? If you saw a box on a shelf entitled thusly, would you pick it up and look at the cover? What kind of expectation would you have of it? 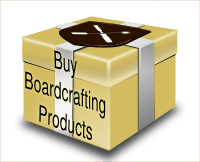 Boardcrafting was in the New York Times (sort of)! 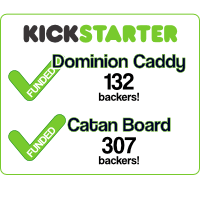 I was doing some vanity googling tonight, as one does – sometimes it’s fun to see where images of the Boardcrafting Catan boards pop up, and I saw a still image clearly captured from a video. On further investigation, it was a video from a NYT tech blog featuring Dan Shapiro talking about Glowforge. Very cool! In their early prototype stage, I shared the Catan tile designs with the Glowforge folks, and I’ve seen it in their marketing materials here and there. They’ve since created their own in-house Catan design, but this NYT video was shot when they were still using mine. If you’re interested in laser cutting, check out Glowforge, I’ve got one myself and am very happy with it. Plus, they made me famous. I’ve been dabbling in Role Playing Games like D&D lately. I’ve been using a commercial online game supply maker to make some playing cards for a RPG I’m designing, and I’m pleased with the results.